Money for research is critical. However, the NIH currently funds only 11% of its applications, leaving a heavy burden on private foundations and individuals to help close the gap. As a result, we direct funds to leading research institutions, such as the Mayo Clinic’s Amyloidosis Research Fund. For those monies donated to the Mayo Clinic, Dr. Morie Gertz explains where our donated dollars go. In addition, donations support the Amyloidosis Speakers Bureau (ASB), an important initiative sponsored by Mackenzie’s Mission. The ASB will focus on educating the next generation of doctors during medical school about this disease, through presentations from amyloidosis patients. Thanks to a generous patron covering all of our administrative expenses, 100% of your donation will make a difference in raising awareness to shorten the time to diagnosis, finding desperately needed treatments to extend lives, and finding a cure to save lives. Being a registered 501(c)(3) public charity brings a responsibility to maintain a sound governance structure, run a cost-efficient operation, and provide transparency to our donors. 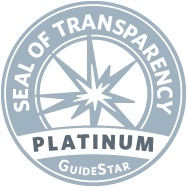 We are extremely proud to have earned the Platinum level Seal of Transparency (the highest level available) by GuideStar, an organization committed to monitoring the nonprofit community and setting forth standards for best practices.